Rutgers–Newark, founded in 1950 and based in Newark, NJ, is one of three regional campuses of Rutgers University. It is one of the nation’s most distinguished public research universities and consists of seven degree-granting schools that offer undergraduate and undergraduate programs for over 12,000 students. The U.S. News & World Report has ranked Rutgers-Newark as the most diverse national university in the United States. In 2011, Rutgers-Newark asked Advomatic to work on strategy, redesign, and development for their dated web presence with a brand new Drupal 7 site. We worked with an outside design firm to come up with a fresh, modern look on both desktops and mobile devices. This redesign also focused on displaying a wide array of manually and automatically curated content. We had many solutions immediately available to build the site according to the client’s needs since this site was to be Drupal 7. These needs included advanced content management, third-party integrations, department-specific minisites and search capabilities. Rutgers-Newark also needed to limit access to various function across their staff, which could be handled by Drupal’s extensive roles & permissions system. 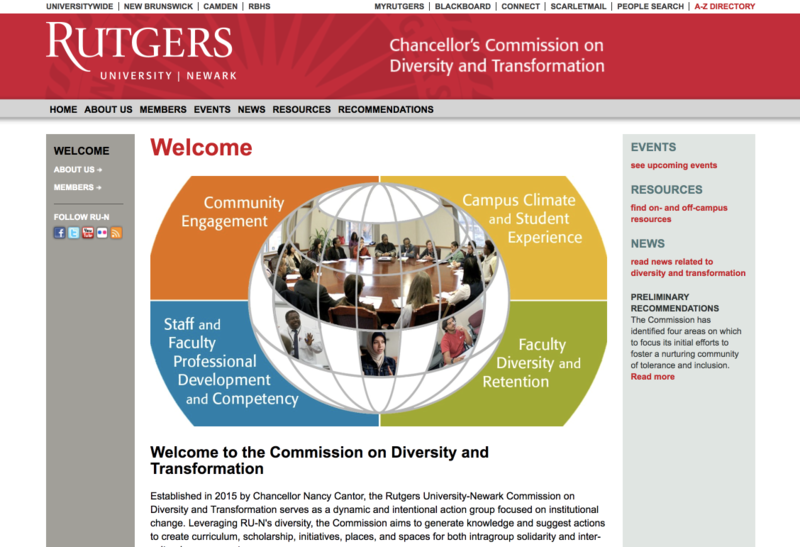 To organize Rutgers-Newark’s content, we built several new content types. We migrated some older content from WordPress to Drupal. We also built several new landing pages and blocks(driven mostly via the Panels and Views modules) which the editorial team could use to manage featured content. Using the Nodequeue module, we developed a number of slideshows & carousels to bring attention to important content. Featured events were created, allowing for user signups and reminders. In addition, we added functionality to allow the campus to post eye-catching Campus Alerts that showed up on every page when there was an emergency or important information to get out. Rutgers-Newark has an active and robust collection of photography on Flickr dating back several years. To take advantage of that, we developed a custom gallery and slideshow for their new site that includes photos from that collection. Youtube videos are also managed editorially through administrative queues. We also built content types that could be location-tagged through integration with Google Maps, opening up global geocoding. This allowed us to create custom maps and map markers showing all of the places associated with location-based content. Rutgers-Newark has a number of internal departments and wanted a web strategy to minimize costs on each department’s site. They wanted to use the new redesign for their subdomain sites, yet keep the content separately managed. To do this, we set up a system using the Domain Access module that allowed for configurable subdomains and domain-specific administrative permissions. 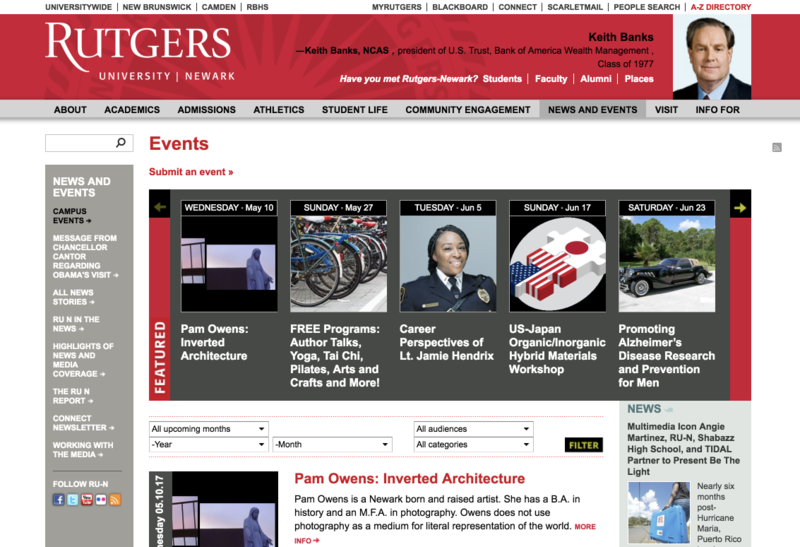 Department sites were allowed to create their own content and pages, and a custom header to separate these sites from the main Rutgers-Newark site. Staff directories created on the main site displayed staff from all departments. 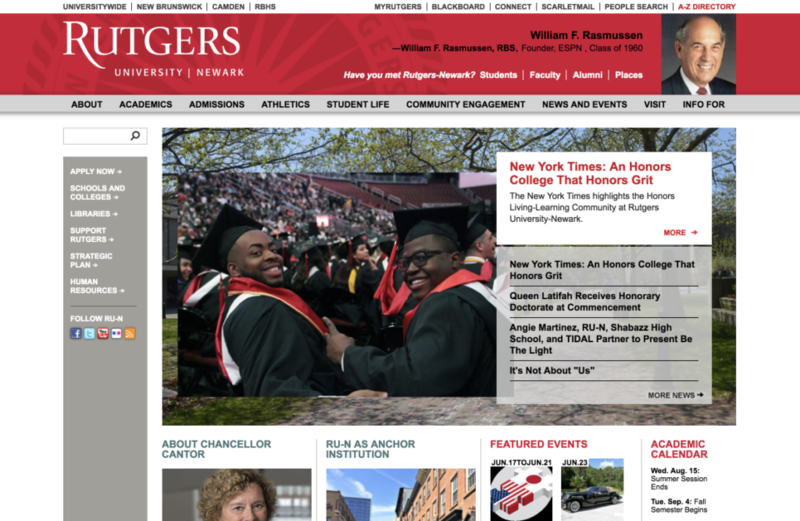 Rutgers-Newark wanted search functionality that crossed all of their subdomains as well as their main site. We implemented a search feature powered by Apache SOLR to meet the client’s needs. This resulted in a user-friendly, fast, and faceted solution. The year was 2011, and it was time to go mobile. Advomatic set up a system to detect if the user was viewing the site on a mobile device. If so, they were directed to a separate, simpler version of the site that was optimized for small screens and slower connections. Advomatic has provided ongoing support and targeted improvements since the 2011 redesign, keeping the site’s layout and usability up to date as web standards have evolved. Read more about it.